Mom's Gone Bronson! : TODAY ONLY! 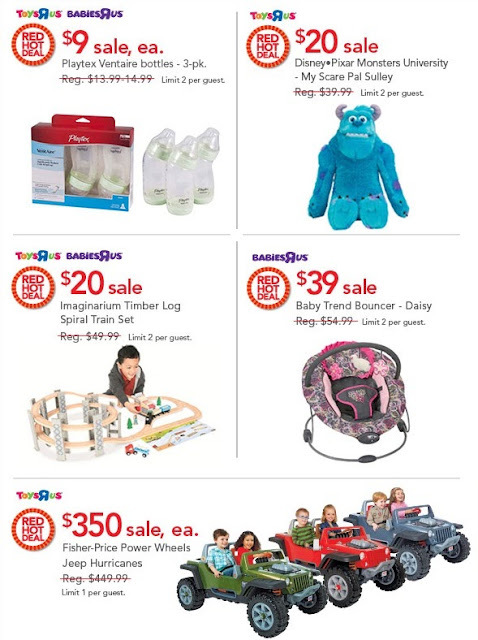 Deals at Toys 'R' Us! If you are looking for gifts for Christmas already, or perhaps you have a lot of birthdays between now and then or a little one on the way - then head on over to Toys R Us TODAY ONLY *August 21st* to snag some deals that will rock your socks! Bottles for almost half price, Sully from Monsters Inc/Monsters University for JUST $20! A super little wooden train set for JUST $20 and more! Call ahead to your store and see if the items you want are in stock and available on this sale!! Let me know if you pick up any bargains!! Disclaimer: I am in no way associated with Toys R Us and am not being compensated in ANY way for this post.